Please join us for the following two events. The evening event is designed for parents of kindergartners enrolling for the 2019-2020 school year. 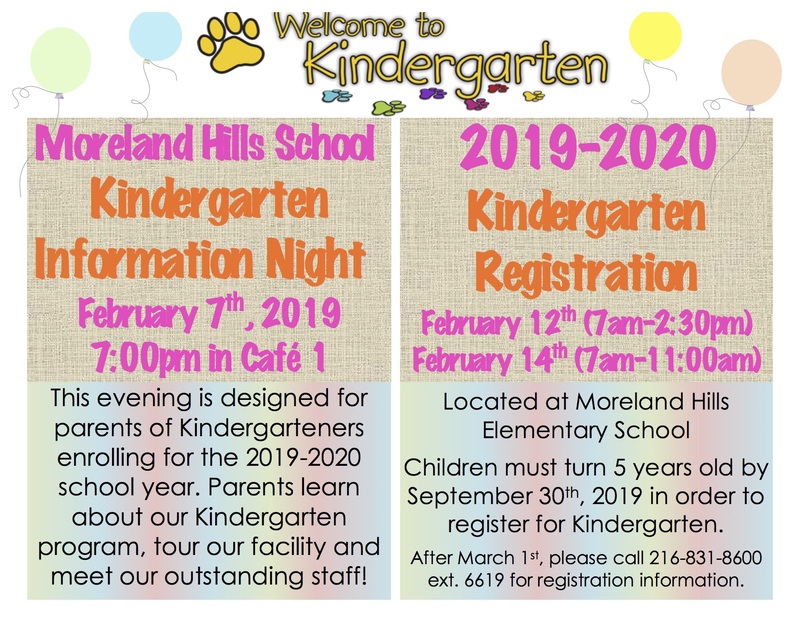 Parents and guardians will have the opportunity to learn about the kindergarten program, tour Moreland Hills Elementary School and meet the outstanding staff members. For more information, call 216-831-8600. February 12, 2019 from 7 a.m. to 2:30 p.m.
February 14, 2019 from 7 a.m. to 11 a.m.
Children must turn five years old by September 30, 2019 in order to be registered for kindergarten. For more information, call 216-831-8600, ext. 2234. NOTE: If you have a child enrolled in the Orange Inclusive Preschool (OIP), he or she is already registered for 2019-2020 kindergarten. Their student information will be transferred directly to Moreland Hills Elementary School.